I realize that you’re not supposed to base a major life decision on something as inconsequential as footwear, but these weren’t just any old shoes. These were my Jimmy Choo polka dot sling back sandals. As a starving college student I couldn’t afford to pay retail so I surfed eBay and scored a pair for less than half the original price. Even so, they represented a major indulgence for me; I saved my tip money for two solid months to pay for those suckers. And then Johnnie ruined them and threw them out. Maybe I should be grateful on some level that Johnnie did what he did, but I haven’t managed to evolve to that point yet. I’ve done a lot of healing and a lot of growing, as my shrink used to say, but I’m still royally pissed at Johnnie about those sandals. 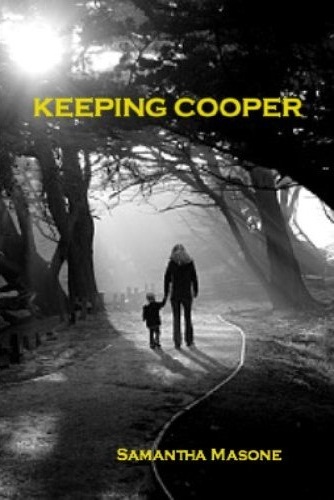 Wow, I really enjoyed Keeping Cooper! Such an exciting thriller with so many twists and turns that you don't always know where to look or what to expect. The book tells the story of a woman called Casey who is fresh out of university and is thinking of going to graduate school. While she's back in her hometown trying to decide her next move, she meets Johnnie and the two of them begin a passionate love affair. However shortly after they move in together, their relationship reaches boiling point when Johnnie becomes possessive and violent, leaving Casey with another decision: should she stay with Johnnie and become his slave, or should she try to escape? After she has made her choice, Casey's life begins to take yet more unexpected twists as she meets new people and handles some pretty heavy situations. Keeping Cooper is very well written and highly imaginative. There were some parts of the story, however, where I got a little confused, just because there's so much going on. Once or twice I lost my bearings and had to go back a page or two and re-read. I also thought that there were some bits that could've been omitted as they seemed to make certain parts drag on a little. But really, these were minor ailments. If you enjoy some thrilling suspense, then you're going to want to read this. I'm very glad that I did as it's a great story!